We pray that tonight would be encouraging for you. If you're a guest here with us, we invite you to fill out our communication card in our app or at the Next Steps table in the back of the auditorium after service, we'd love to meet you and we have a free gift for you. 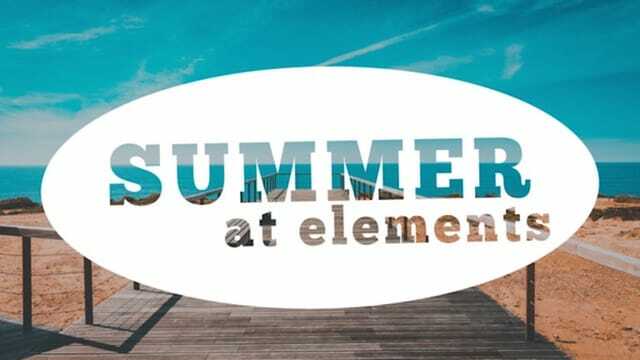 Click the link below to see THE WEEKLY - our digital announcements/info for all things happening in and around Elements...or find everything ya need in our app. Have you ever spent time at the lake? Skipped rocks across the water? There is a reaction that occurs when the rock touches the surface of the water - it's called the "Ripple Effect". Webster's says it's like: a spreading, pervasive, effect or influence; or a situation in which one event causes a series of other events to happen. Jesus has come into our lives and, by the presence of his Spirit, he is shaping us and making us to be people (the church) after his heart and a people who can have a ripple effect for HIM in this generation and the ones to come! an ever-expanding reach of impact and influence for Jesus. The church carries the proclamation of redemption in a world filled with corruption. The church is the steward of the gospel. The Good News that life with God is available through faith in Christ! To one – to ALL. To every tongue, tribe & nation. The church carries the power of community in a culture filled with isolation. The church carries the power of healing in a world bathed in brokenness. The church carries the LIGHT & HOPE of Jesus – a hope that can uplift the downcast and the light that illuminates a path forward for those searching for truth and desiring a life of significance. Jesus said His Father is always working… and that He is always at work as well. We’re to join in that work, to partner with God in His activity. God is at work. God is still active (he’s not distant, distracted, or dormant - friends). God is active in an ever-expanding scope of work…in us, through our reach, within our city, all around our world. We’re to do that here & now - within the scope of our reach that we have. God IS still at work! In Ecuador. In Tucson. We – (you and me) as the Church – have been invited to join in. We’ve been sent – active agents for God and His good within our reach. And We’re to have an ever-expanding reach of impact and influence for Jesus. That doesn’t mean we have to work harder and do more in order to be right with God. We live by grace, not effort. And God recognizes we’re limited in our scope, capacity – but the truth WE MUST WRESTLE WITH IS: in our fast paced, FULLY scheduled, commotion oriented life – are we shutting off our reach? Are we cocooning more in order to stay safe and comfortable, not be inconvenienced and thus missing out on the ever-expanding work of God that’s going on around us? Missing out on partnering with HIM? -Is our vision expanding to see people the way Jesus does? To notice people more this year then we did 3 years ago? -Is our time expanding – able to be interrupted by assignments/opportunities that Jesus brings across our path to partner with him in sharing love, hope? -Are our resources expanding in God’s direction – open to his leadership and direction and not just sequestered for our usage alone. -Is our compassion expanding – our hearts open to get involved with what God is up too with quicker reaction and deeper effort? God’s looking for his followers to work and partner alongside him. Because God is still at work friends! With Jesus – we’re to have a ripple effect for God & His good, his impact and influence in this world – for this generation and generations to come. I’ve sailed on the Sea of Galilee and I’ve floated in the Dead Sea. Both the Dead Sea and Sea of Galilee have freshwater inlets. Yet only one teems with life. The Dead Sea actually has *more* freshwater flowing in, but everything stagnates, shrivels, dies. Because it’s AlLL intake, NO output. an ever-expanding reach of impact and influence for Jesus. NEED PRAYER? ....we've got some of our prayer team and pastors available following service to pray with you. Or you can text the word "prayer" to our phone number: #520-300-9001 to submit your prayer request or submit one via our app. We look forward to partnering with you in prayer.